This Month on the Web: Webpages to check out! What’s going on on the web? 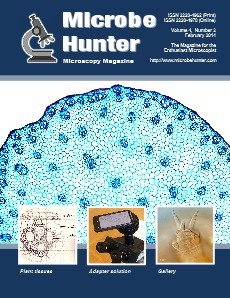 Here is a summary of microscopy related publications of the last few weeks. Connecting a mobile phone camera to a microscope requires an adapter which centers the camera over the eyepeice. Here I will have a first look at an adapter which does exactly that. The flowering plants can be divided into the monocots and the dicots. Microscopic observation reveals some distinct differences between these two plant divisions. Image of a rabbit tongue, of a water flea and feet of rotifers.